No electric available. Restrooms onsite. More details to follow prior to the event. activities, Vending, Hula Hooping, Massage, Food & Beverage. By registering you agree to release the Producer and Venue, its agents, officers and directors of any and all liability and claims that may arise from any injuries, damages or losses suffered or incurred by you or to your property in connection with this event. You shall defend, indemnify and hold harmless the Organizers from and against all actions for personal injury, property damage or death arising or resulting from or in connection with the operation of your concession, including claims by your employees. Further, you agree that this release is binding on your heirs, executors and assigns. Rich has produced a total of 43 not-for-profit/benefit festivals, and hundreds of ongoing indoor events, including Live At The Kahuna, Live Art Fusion, ArtMOSPHERE, Northport After Dark, Art Cafe, and Grateful Jam. 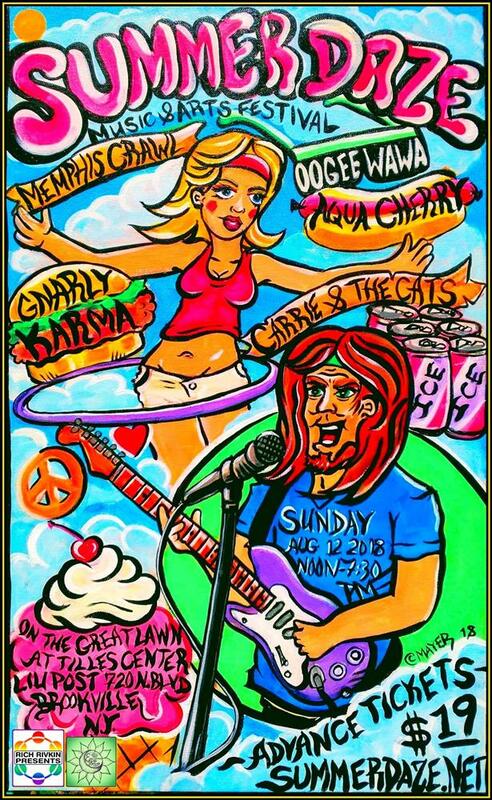 His annual multi-themed Summer Arts Festival Series is hosted at several well known outdoor venues, and features legions of artists painting to the music of Long Island’s favorite bands.